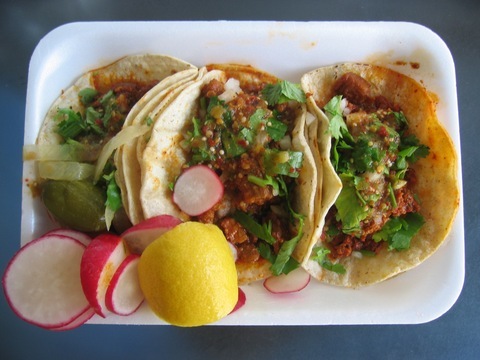 Fronteras: The Changing America Desk reporters investigate the transformation of the taco in the Southwest — from cheap street eats to gourmet delights, from a Mexican mainstay to an breakfast staple. Consider the taco. A corn or flour tortilla filled with something tasty. It’s a simple concept, but the possibilities are infinite. In San Antonio, Texas, the Datapoint Taqueria is a white food wagon that each night gets unhitched and dropped off on Datapoint Drive. They serve up traditional Mexican taco plates, very similar to what you can find anywhere in Mexico — tacos pastor, barbacoa, carnitas. You have to pay in cash. 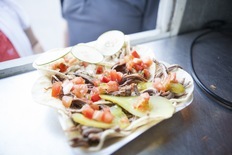 The foodie website urbanspoon.com gives the taqueria an adoring 92 percent score. Kosher taco. Courtesy of Peter Svarzbein. Chorizo taco. Courtesy of Joey Palacios. 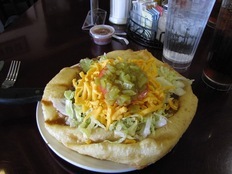 Navajo taco. Courtesy of Laurel Morales. Fish taco. Courtesy of Adrian Florido. KoMex taco. Courtesy of Kate Sheehy. Raj and Tanzima are a married couple from Bangladesh and had heard how good the tacos are here. “So this is the first time that we came here. And she tried it a couple of times,” Raj said. But travel two blocks up the street to Taco Bell and the taco experience is very different. This is where they make a Mexican-food-like-substance from Cool Ranch-flavored Doritos taco shells. Taco Bell is pushing the limit of what defines Mexican food in this country, and forcing the question: Is the taco evolving in America, or mutating? Whatever the answer, Americans are eating it up, including the fast food restaurant’s newest creation now being rolled out in limited test markets: the breakfast waffle taco. Some might call it a gastronomic atrocity, and the waffle taco has as much to do with tacos as moon rocks, but Zaragoza gave the waffle taco two thumbs up. Between Taco Bell and the Datapoint Taqueria there’s a vast spectrum of taco. Somewhere in the middle is Taco Cabana, a 24-hour Mexican food chain that started in San Antonio 35 years ago. It now has 166 locations in four states and is still growing. In the Taco Cabana secret test kitchen Corporate Chef Diego Galicia works with focus groups. On the wall of the test kitchen are product posters of some of their hits, like the Fajita Norteño Taco. It is one of the ideas Galicia found during his frequent explorations of Mexico where he searches for new ideas and the latest tacos trends. Galicia is looking for the taco sweet spot: a taco with Mexican street cred that can be marketed to “gringa” soccer moms who have never been south of their hometown’s Cesar Chavez Boulevard. But some here in San Antonio are also taking the taco uptown. Take Elizabeth Johnson, a Latin Cuisine Specialist at the Culinary Institute of America. Johnson also develops items for the menu at NAO, a CIA Latin restaurant in San Antonio. She said we are seeing a “tacofication” of foods. With all kinds of ethnic foods merging with tacos, such as Korean Barbeque, Chinese dim-sun, Polish sausage and the Belgian waffle. She explained this is happening because the United States is changing, especially the younger generation. And Johnson said the tacos are telling us something. “When you say, ‘does every taco tell a story?’ I say, you bet it does. Because it tells about the people who are working in those areas, the people who have migrated to those areas, and they have brought their culinary traditions and their culture,” she said. So the next time you pick up a taco from a fast food window or from a street vender ask yourself: What story is that taco telling you?